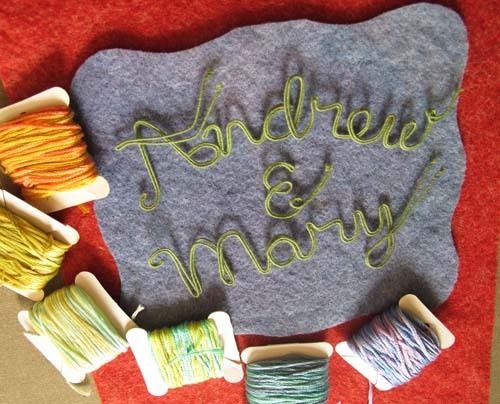 I made this wedding banner for my son Peter to give to his good college friend Andrew, who was married last Saturday. The wedding was in Biddeford Pool, Maine and since the couple met sailing there, I gave the banner a nautical/seaside flavor. I wrote out their names in doubled up 32 gauge florist wire, since I ran out of thicker stuff. 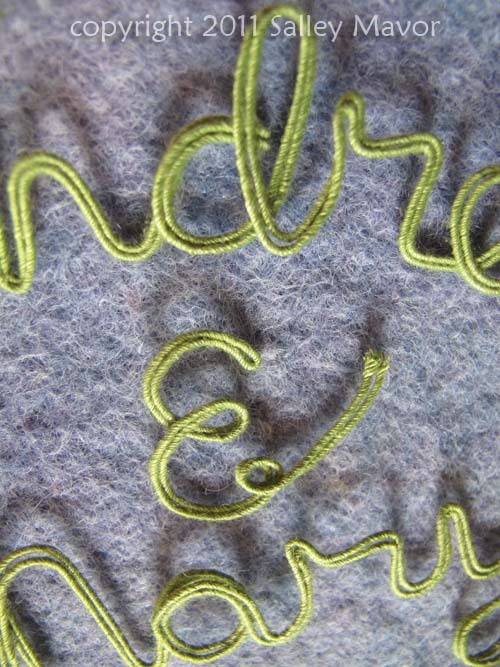 Then I picked out some variegated embroidery floss to wrap the letters. 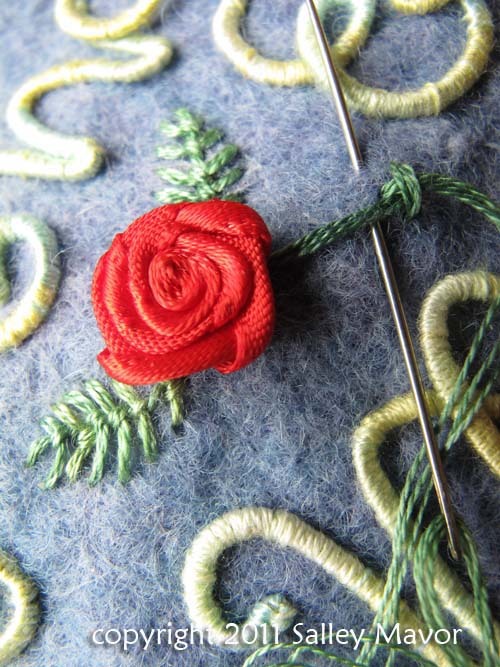 I added 2 purchased red ribbon roses and then stitched some leaves around them. The had a whole bunch of shells with holes that came from a necklace my grandmother got in Hawaii about 50 years ago. 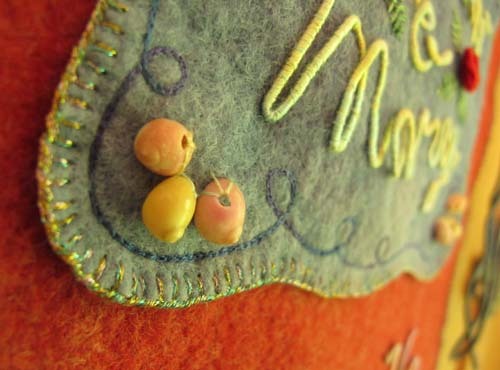 The blue piece of felt is edged with metallic thread, which is nasty to sew with, but the sparkle looks good. 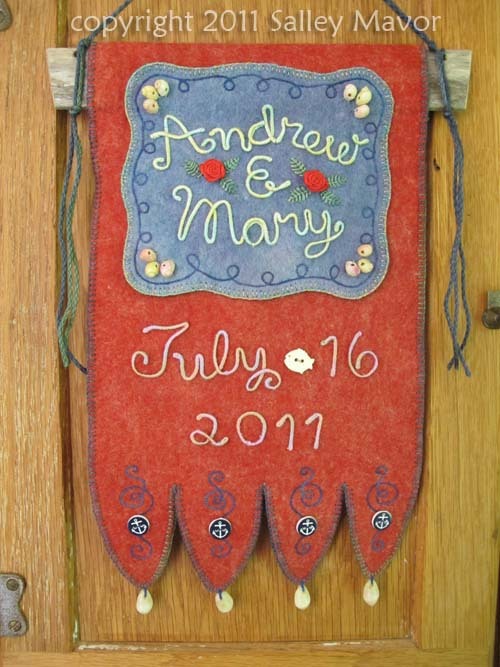 The felt banner is hung from a piece of driftwood, which was probably part of an old wooden lobster pot. I found some anchor buttons and a fish in my stash to add and some more shells to hang from the scalloped edged bottom. 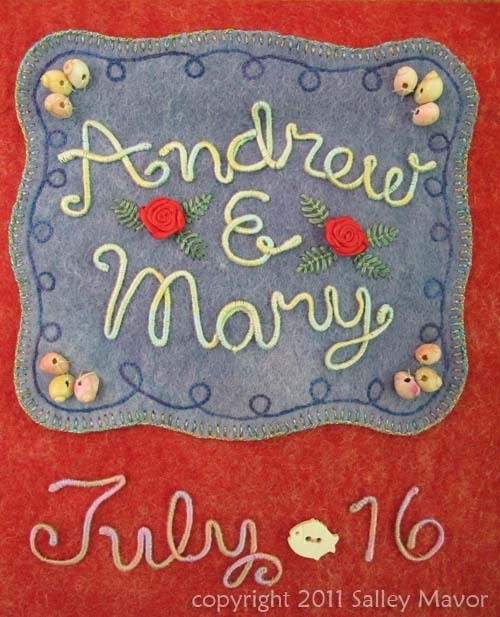 Best wishes to Andrew and Mary! See posts about making other wedding banners here. 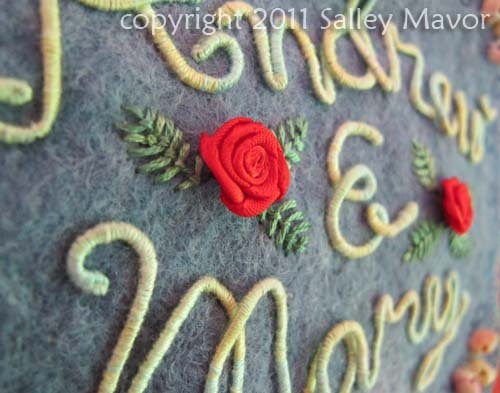 This entry was posted in Embroidery, Felt, Found Objects, Gift, my design productions, wedding banners by Salley Mavor. Bookmark the permalink. Once again, you treated the wedding couple royally and helped to make their nuptials “a banner day”! I love how you personalize each wedding banner, using items you “just happen to have”. I have lots of those things too, but have not been able to find the right use for them…YET! Thanks again for inspiring and enlightening me. Wrapping the florist wire is such a great idea. Thank you for sharing 🙂 The banner is a lovely idea for newlyweds. I love how personal this is for the couple, SEW BEAUTIFUL Salley. magnifique, j’aime beaucoup cette bannière et tout ce que vous faites…. Gorgeous, Salley. Thanks for including the details on how you wrote and wrapped the letters, etc. What an heirloom you’ve made. What a special gift! Just beautiful! 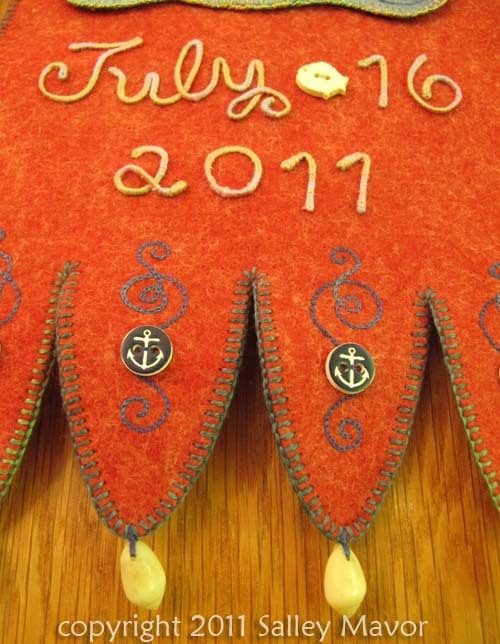 What a wonderful piece for their wedding and love the hanger, lends to the whole nautical theme. This will truly become an heirloom. Lovely work, wonderful colors, and a gift they will treasure! What fun your life must be, always on the “lookout” for buttons, beads, scraps of wood, fabric, threads, cast off jewelry…any thing that can be transformed into something more beautiful. The whole is more than the sum of its parts? I never fail to be awed by both your stylistic sensibilities and your impeccable craftswomanship. A beautiful and unique keepsake. Thanks for sharing it with us.